On Wednesday I picked up my first box of organic from the High Country Conservation Center’s Summit CSA (Community Supported Agriculture). 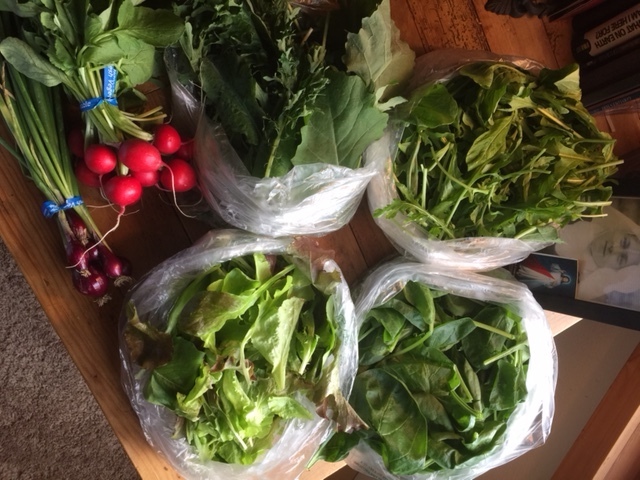 Way back in February, I bought a ‘share’ in this summer’s crop, which entitles me to a weekly box of organic vegetables from mid-June through October. Now that the vegetables have arrived, I have two reactions: 1) Wow! This is so exciting! Look at these beautiful vegetables, I’m going to be so healthy. 2) Yikes! What am I going to do with four bags of greens? For the next sixteen weeks, I want to share my culinary adventures as I cook my way through my CSA box each week. Even if you don’t subscribe to the CSA share, you’ll enjoy these recipes which focus on our summer bounty. I hope you’ll also be inspired to try more vegetable-centered meals. Now, back to those four bags of greens! This week’s recipe polished off two of the bags immediately. 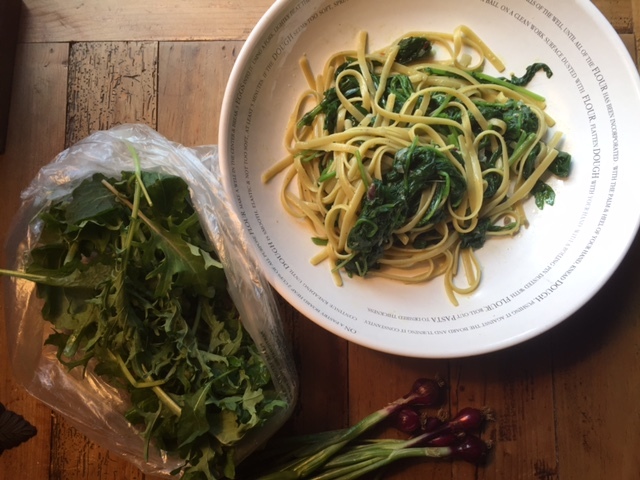 You can make this easy and tasty recipe for two or four people, just increase the amount of greens and the amount of pasta. 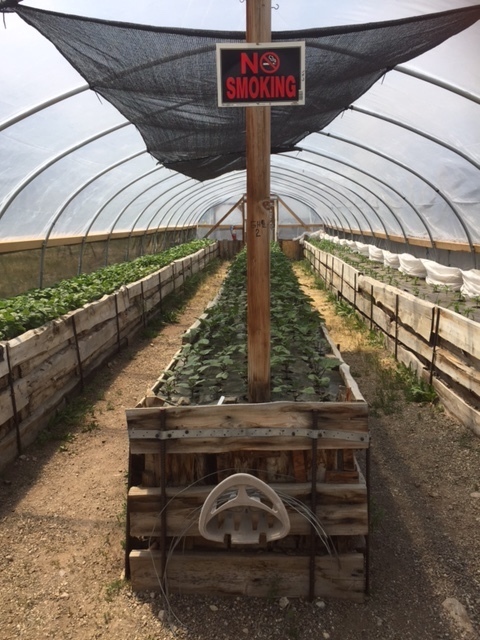 Keeping the ‘sauce’ simple allows the taste of the farm fresh greens to shine through. 1. Bring one large pot of salted water to boil. (you want the water to have enough salt to taste like ocean water, this will flavor the pasta while it cooks) While the water boils, Add the extra virgin olive oil, the greens, garlic, and onion to a large pan and begin to gently sauté. 2. Once the water has come to a boil, add the pasta and allow it to cook until ‘al dente’, which means ‘to the tooth’ and refers to a pasta that is cooked, firm, and not mushy. Drain the pasta, and then add the pasta to the pan of wilted greens. 3. Add a tablespoon of butter, a grating of parmesan cheese, and toss the greens and pasta together. Serve immediately. Enjoy!